Just took a quick trip to St. Louis to see my high school girl friends and my niece’s first “big girl” apartment. Fun, exhausting trip. Maybe I’m just really tired, but where would one ROAM in an airplane cabin? Roam?! Really? I realize this is a random post, but it got me thinking….maybe we should choose our words more carefully. Instead of roam; maybe stand, stretch your legs, use the lavatory, but roam…. aimlessly about? Yes, I’m tired, and didn’t really plan on roaming anyway. But I will start thinking more about MY word usage, should I confuse anyone else into roaming. Mom and dad were bird watchers, and squirrel watchers. Dad still puts peanuts out every day for the squirrels and birds. He says he knows every animal that shows up, even named one squirrel Red. The day after mom died two doves came to his back yard. He pointed them out to me. “I’ve never seen them before, they’re new. Do you think your mom had something to do with this?” I said yes. Before he could answer, two doves flew up and landed alarmingly close to us on the porch. We pointed them out to the kids. 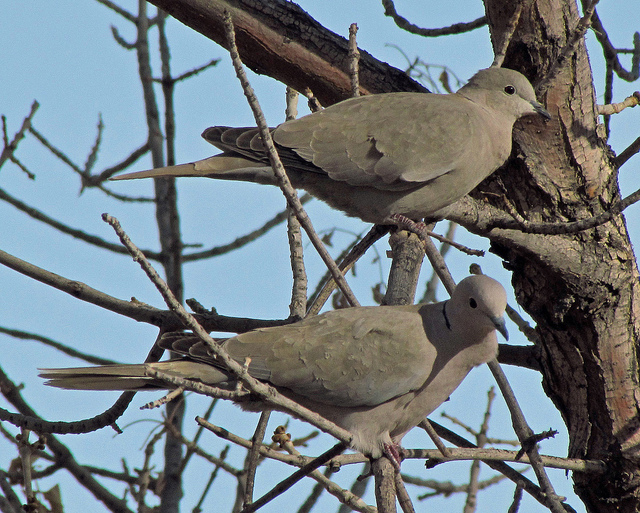 Dad says, “Look, there are your grandma’s doves!” They moved to a tree and stayed for a bit, watching over us. Is it strange that I feel comfort from those doves? Bob and I have been working on remodeling our basement. After a few pipes burst, and then discovering that our basement floor was sinking due to some poor backyard drainage issues – we decided to turn a disastrous situation into a good thing by remodeling our entire basement/back patio. I’ve had more than a few workers in and out over the weeks and have heard myself on more than one occasion respond to suggestions, “It’s just a basement.” I am trying to stay budget conscious and really do not want to use the most high end fixtures or finishes. It’s just a basement. So yesterday while Bob, dad and I were painting and I overheard Bob respond to my dad when he thought he’d messed up a bit, “Don’t worry it’s only a basement.” My entire basement perspective changed. Perspective. Caleb was adjusting his attitude, his perspective from a place of great faith. Does everyone’s relationship with God, or for that matter with anyone, have an ebb and flow? Saw an old friend this past weekend and had a wonderful visit. Upon leaving I asked, why don’t we see each other more? Why does a relationship take so much work. Does my relationship with God take so much work, too? If so, am I up to the task, am I putting in the work that is required? I would say over the past few years no. Mom’s been gone almost 3 years. I’ve missed her. That relationship didn’t take work. The funk I’ve been in over losing mom (and the myriad of other losses I’ve suffered) have caused me to ebb, and have taken me away from God. I ebbed, and I should have flowed. I retreated, I fell back. I was tired, scared, confused, and just lost. All excuses that I readily used to fall into this backward movement that I’m experiencing. Is it time to advance again? I’m praying that God will pull me into that place where I need to be, closer to Him. I want to experience a new relationship with Him. Where He can flow. Marriage is hard. Sometimes I think I want something out of it that may just be impossible. Doesn’t God tell me all things are possible with Him? So I’ll keep on hoping. Sometimes I just want someone to take care of ME. and comforts me. He has before, He will again. The chest pain….still here, not as bad.